Sew what's cooking with Joan! : Champagne Custard Shooters! You may remember my Champagne Cupcakes from two years ago! That recipe has gotten thousands of hits especially at Christmas, New Year and Valentines day. I found another dessert that is not only delicious but, very pretty. 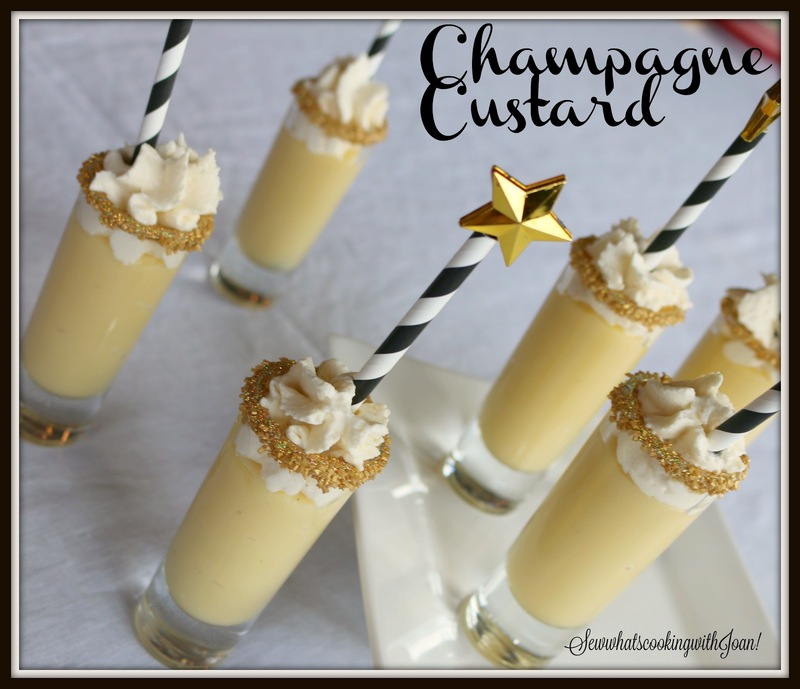 Full of Champagne flavor this custard is so good I scooped out a couple teaspoons into my mouth! I used Veuve Cliquot as we were drinking that later, but, you can use any sparkling wine or your favorite brand of bubbly! 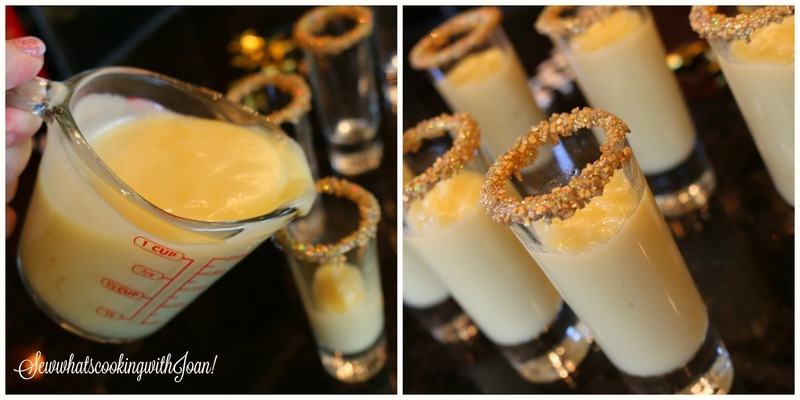 I used mini 2.5 ounce parfait glasses, but, you could use any 2-3 ounce shot glass you have! I combined two different products for the gold rim and gold rim, one is real sparkly and the other is chunky, both work for the look. I bought the black and white straws and gold stars on Amazon too. In a bowl, whisk cornstarch in 1/4 cup of heavy cream, set aside. 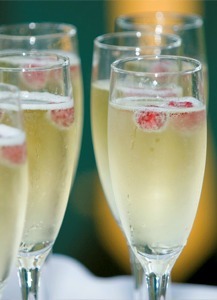 Combine the remaining heavy cream, sugar and 1/2 cup champagne in a saucepan; heat until the mixture just starts to bubble. Avoid letting it boil or the champagne flavor will cook out. Remove from heat. Beat the whole egg and egg yolks into the cornstarch/heavy cream mixture. 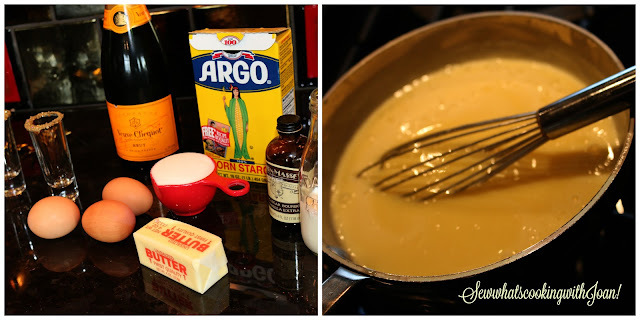 Pour 1/3 of the boiling champagne mixture into the egg mixture, whisking constantly so the eggs do not cook. Return the remaining champagne/heavy cream mixture to a boil. Pour in the hot egg mixture in a stream, whisking constantly until the mixture thickens. Remove from heat and beat in the butter and vanilla. Divide among the 6 sugar rimmed parfait glasses. Refrigerate until firm. In a medium bowl, beat heavy cream with hand mixer until soft peaks form. Gradually add sugar and beat until peaks form, add vanilla and beat again. 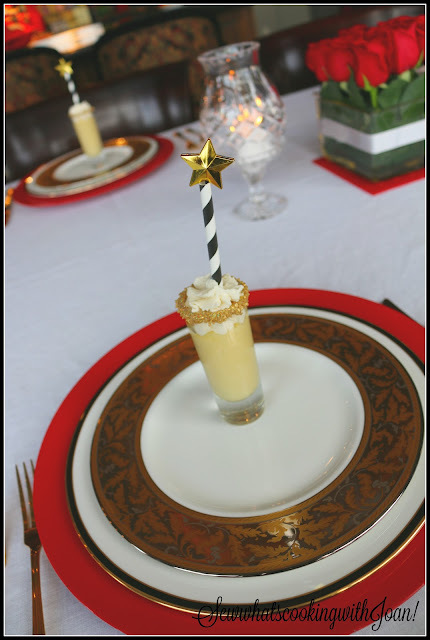 Use a piping bag fitted with large star tip to pipe cream onto the custard. These tempting recipes are show stoppers! Follow this link to New Years Day Wrap up! I am taking a few weeks off, I will be back by the end of January! Thank you for visiting my blog and to all of you my warmest wishes for a Happy and Healthy 2016! Happy New Year Harry and Pam and thank you for the good wishes!